The trade deadline is dangerously approaching to teams who have not quite made up their minds about what to pull off. Normally I do not pay too much attention to the rumors about who is going where, frankly because that’s all they are – rumors. There have been a couple marquee moves made already, and there will inevitably be more made. With less than 26 hours left, sellers stand by the phones while buyers assess their needs and make calls. Last night, Hunter Pence was removed from the fifth inning of the Astros’ game to depart for a team in the playoff race. 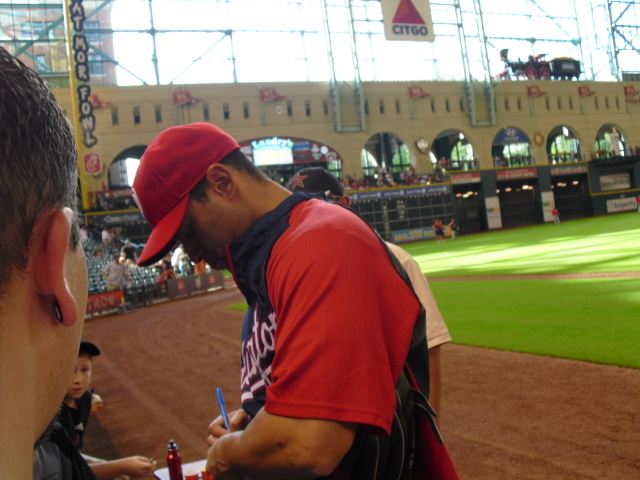 Pence was loved by the fans and players in Houston, but I am sure that he would much rather play for a team in the race. Philadelphia acquired Hunter Pence in exchange for two single A players. An all-star for class A players? Despite the fact that they are both in the top 25 prospect list from MLB.com, I must agree with Bob Carpenter who said sarcastically, “That will work wonders for the Astros’ season ticket sales,” last night upon hearing the news of the trade. July 31 is probably the one day of the year where I really wish I had an iPhone so I could followe up-to-the-mintue news on possible trades in baseball. As for the Marlins, they are always mentioned in trade deals, but never seem to be in the headlines on August 1. In 2009 they traded for Nick Johnson in an attempt to solidify their lineup for a playoff push, but they quickly fell out of contention. Last year Jorge Cantu was traded at the deadline, and Cody Ross left the team soon after. The Cantu trade brought the Marlins a couple minor league pitchers, big whoop. I’m never a fan of all star-for-“prospect” trades because the “prospects” very rarely live up to their hype. Another blockbuster trade made this week involved Carlos Beltran. He was also almost a no-doubter to leave New York. The Giants are looking to defend their 2010 World Championship Title and believe Beltran will assist them. Today, news came out that the Nationals shipped Jerry Hairston to the Brewers for AA outfielder Erik Komatsu. Hairston will add depth to Milwaukee’s infield. Ubaldo Jimenez is still being rumored for various trades, mostly involving the Yankees and Red Sox. The Reds, Indians, and Blue Jays are also in contention (MLBtraderumors.com). Rays’ OF BJ Upton is still on the top of the likely-to-be-traded list. The Braves, Nationals, Pirates, and Indians are the teams most likely to make a deal for Upton. Although these teams have other outfielders on their radar. The Nationals are also a likely team to make a push for Astros’ OF Michael Bourn. In addition to Bourn and Upton, the Nats have talked to Minnesota about acquiring Denard Span. Tyler Clippard has been mentioned as a trade piece for Span and possibly the other two centerfielders. Washington is also garnering attention from the media for listening to offers for SP Jason Marquis. The Marlins are not likely to make any deals this year. Leo Nuñez has been mentioned multiple times in possible trades, but the Marlins are likely to keep him for the rest of the year. Ubaldo Jimenez deal in place Colorado to Cleveland.